Saturday was an awesome day in the mail--I received my October kits from Gossamer Blue (just wait until you see them--they are AWESOME!) and I got my September box from Indie Craft Sampler. I couldn't wait to see what was inside and I was not disappointed. 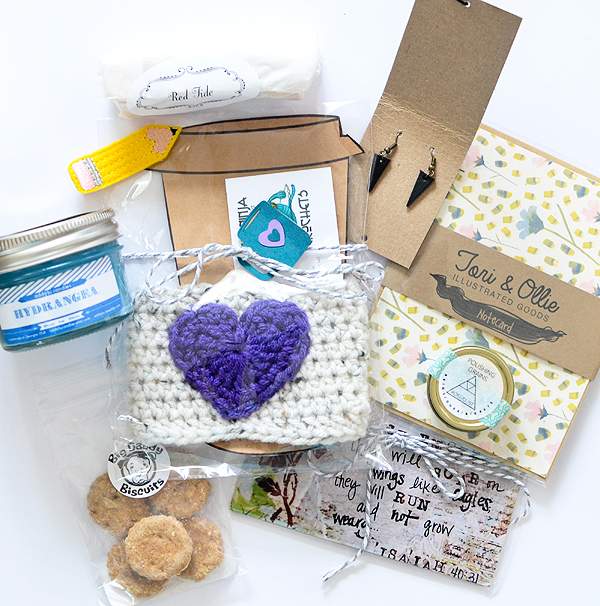 This box was FILLED with neat goodies, all handcrafted by indie artisans. The first thing I saw was the coffee cup cozy by This Ninja Crochets. Don't you want one, too?! I put it to work on Monday's trip to Starbucks--it was most effective at keeping my hot americano from burning my hand. Aren't those triangle earrings from Whole Grain Flair awesome? They're leather! And because I'm a sucker for packaging, I fell in love with the way these tiny things come wrapped up. The little felt pencil hair clip is made by Blue Umbrella Designs. I think it's the perfect little present for my niece, Hazel, who gave herself a haircut a few weeks ago and just started kindergarten. Next up are the beautiful scents that I noticed right away when I opened the box. I can't decide whether to be greedy and keep all 3 soaps from Allie-Jewel to myself, or if I should be kind and give one or two away to friends...They just smell so good! 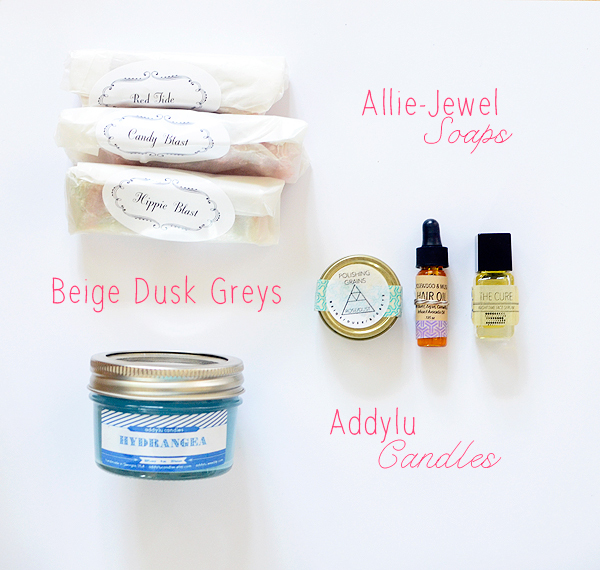 Beige/Dusk/&/Greys (love that name) makes "hand formulated cosmetics" and they smell wonderful! Included in the mini sampler are polishing grains, hair oil, and night serum. And then there is the lovely Hydrangea soy candle from Addylu Candles. I've been enjoying the summer-scent in the evenings, and when it's all gone, I'm left with a small mason jar--bonus! Altered Iris makes the gorgeous collage art prints--I think the "those who hope..." saying is beautiful and uplifting, don't you? 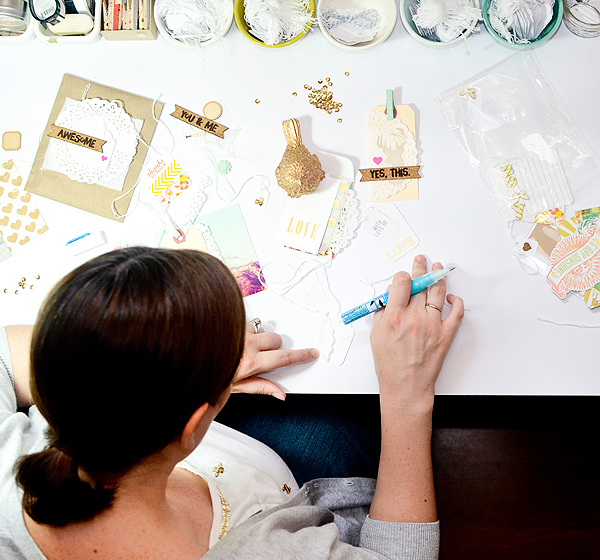 Stationary is one of my obsessions so I'm totally smitten with the Tori & Ollie notecard. Victoria Gedvillas' illustrations are all so soft and pretty...oh, to be that talented! And last, but not least, a few all-natural, organic dog biscuits from Big Daddy Biscuits. Sadly, we said goodbye to our sweet and loyal Rudie-Girl a couple of months ago, but I definitely know of a couple other pups who deserve these yummy treats! 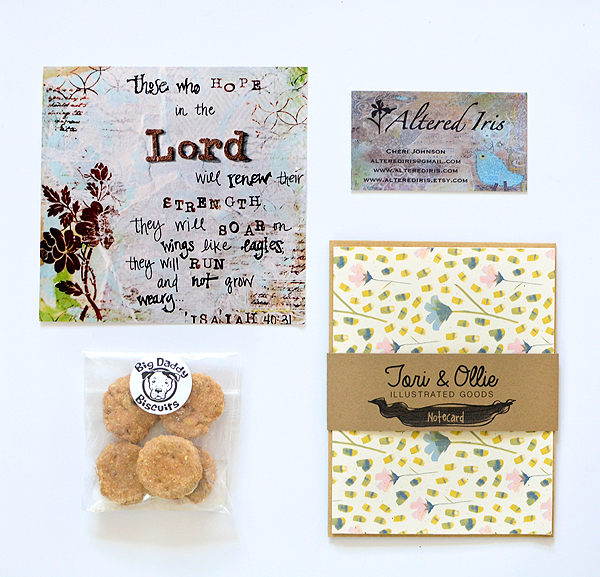 My entire experience with Indie Craft Sampler--both as a contributor and a customer--has been nothing but positive. Tenika and her team WANT independent crafters to be successful and she's gone out of her way to help us all out by starting up this monthly subscription service. She showcased everyone on the ICS blog, kept us all in the loop, asked for input and feedback, and even remembered to thank us all after the first batch of boxes shipped. 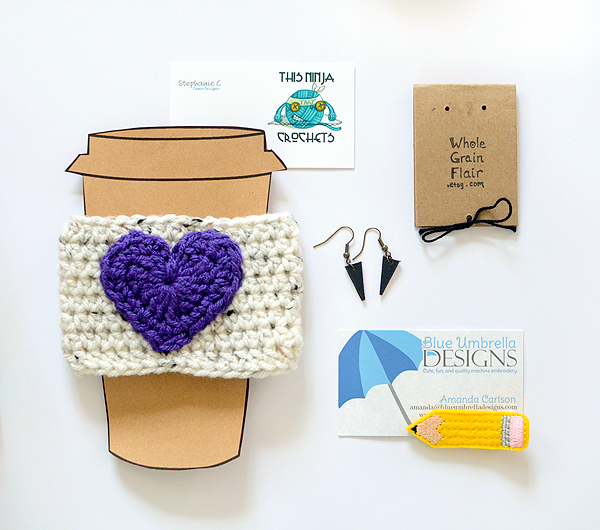 And what you get each month is sure to be a box packed full of unique, quality items handcrafted with love and care. It's a win-win for everyone! If you'd like to buy a box, visit the ICS website for all the details. If you'd like to contribute, you can check out some FAQs and then fill out the application. On a side note, I'm very excited to direct you to the little interview I did with ICS--the questions were awesome (some serious, some fun) and I was honored that Tenika asked me to be a part of the "10 Questions With..." series. Please check it out! And, of course, be sure to check out all of the contributors. The holidays are coming up, after all, and shopping handmade is another win-win for all! P.S. coming back from reading your interview! I loved it. I have an extreme phobia of throwing up too. I went 18 years without throwing up, until last year..ugh. 18 years! How did you go that long with kids?! I'm jealous! The anticipation is the absolute worst.